Two intermeshed oval cogs - mounted perpendicular to the flow direction in a special housing - are caused to rotate by a flowing fluid. One of the two oval gears meshing 90° offset alternately encloses a defined fluid volume between the outer wall of the housing, outer side of the oval wheel and the two flat covers of the housing. Rotation of the oval gear pumps this chamber volume towards the chamber outlet. Two chamber volumes per oval gear - thus totaling four - are pumped per revolution. 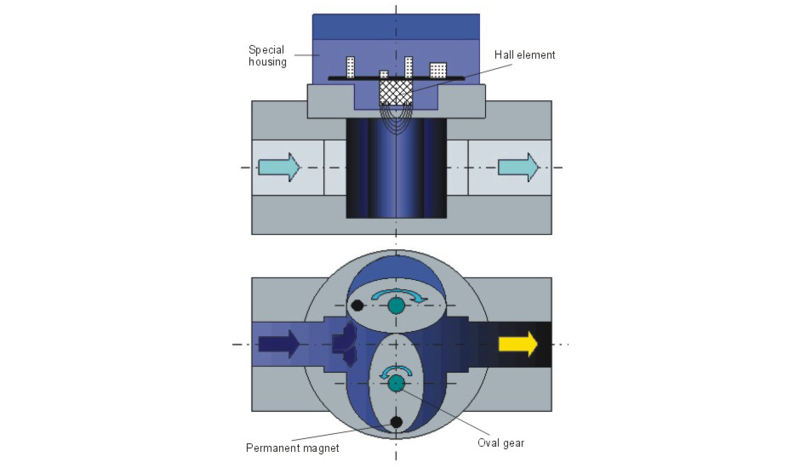 A permanent magnet positioned on one of the oval gears is used to detect the rotary movement. A Hall sensor which detects the magnetic field of the oval gear and generates a square-wave signal is arranged outside of the medium area in an electronics housing. A coil sensor cannot be used since the rotational speed of the oval gear is too low to allow signal detection. The number of pulses is directly proportional to the number of chamber volumes pumped.